BUBBLES put the fun into financial history. 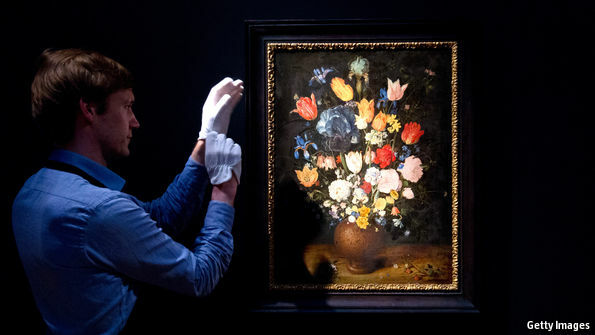 Who can resist stories about Dutch tulips that were worth more than country estates or the floating of an “undertaking of great advantage but no one to know what it is”? Economists have long debated whether bubbles can be identified, or indeed stopped, before they can cause widespread damage, as the crisis of 2007-08 did. But spotting them is easier said than done: even tulipmania may have been caused by a quirk in the wording of contracts that meant speculators would, at worst, walk away with only a tiny loss. For many investors, the more important question is whether it is possible to avoid being sucked into a bubble at the top, and suffering declines like the 80% drop experienced by the NASDAQ 100 index of technology stocks between March 2000 and August 2002. Two essays in a new book*, from the CFA Institute Research Foundation and the Cambridge Judge Business School, indicate just how difficult market timing can be. The first, from William Goetzmann of Yale School of Management, looks at the history of 21 stockmarkets since 1900. Mr Goetzmann defines a bubble as a doubling in a market’s value, followed by a 50% fall. He found that a doubling in a single year occurred just 2% of the time (in 72 cases). On six occasions, the market also doubled over the next year, whereas a 50% fall in the subsequent year occurred on just three occasions; Argentina in 1976-77, Austria in 1923-24 and Poland in 1993-94. Even after a further five years, markets were more likely to double again than to fall by half. There were many more occasions when markets doubled over three years; around 14% of the total. After such rises, the markets dropped by half in the following year on fewer than one in 20 occasions. The markets lost half their value over the next five years around one tenth of the time. But in a fifth of such episodes, the market doubled again. On this basis, a sharp rise in a market is more of a buy signal than a sell indicator. That helps explain why investors find it so difficult to get out at the peak. You can argue whether Mr Goetzmann’s definition of a bubble is the right one. He looks at overall markets, rather than individual industries such as technology. GMO, a fund-management group, uses a different concept—namely, that a bubble occurs when the price of an asset rises by more than two standard deviations above its previous long-term trend. Another approach is to look at fundamentals. Asset prices are supposed to reflect the current value of future cash flows. In theory, a doubling in a market could reflect a sudden improvement in the outlook for that asset class, and thus be entirely rational. 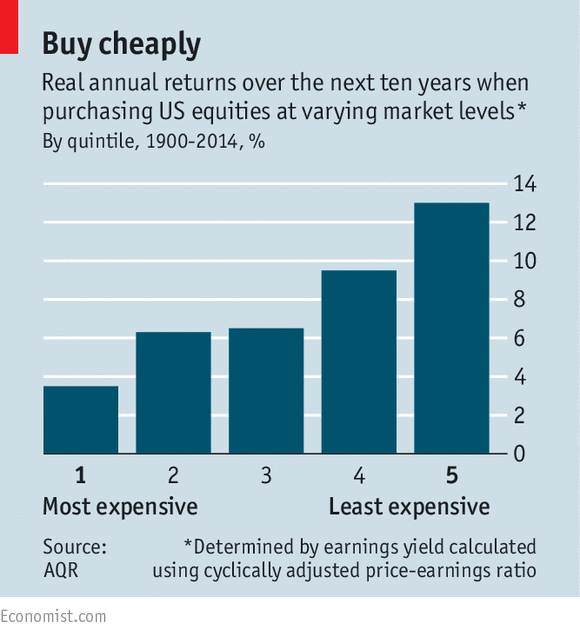 One valuation approach, often referred to in this column, is the cyclically adjusted price-earnings ratio, or CAPE, which averages profits over ten years. Highs in the ratio coincided with market peaks like 1929 and 2000. The problem, however, is that the full historical range of valuations is available only with hindsight. Investors in the 1930s did not know that they would be buying at the cheapest level the 20th century would see. And the ratio is of little use in the short term: the market looked overvalued on the CAPE measure for much of the 1990s, not just at the peak. So Mr Ilmanen devises a simple approach to show whether investors using the range of CAPEs that would have been known at that point could have been used to time the markets since 1900. Over the full period this tactic mildly outperformed a “buy-and-hold” strategy, but all the outperformance occurred in the first half of the sample. It would have underperformed for the past 50 years. This is not very encouraging. Neither a doubling of the market nor a historically high valuation are reliable sell signals. Of course, that shouldn’t be too surprising. If timing the market were easy, big swings in prices would not happen in the first place. * “Financial Market History: Reflections on the Past for Investors Today”, edited by David Chambers and Elroy Dimson. As they spoke last weekend, protests were mushrooming at airports around the country, prompted by travel restrictions imposed by executive order on seven Muslim-majority countries deemed to pose terrorist threats. The temporary ban had morphed into a public-relations debacle. Lawmakers were blindsided. Government agencies puzzled over its meaning. Travelers were plucked from lines as they were boarding airplanes. In the weekend meeting and another one on Monday, Jan. 30, Mr. Trump sought to avoid a similar misstep by clarifying the roles of senior staff members who had been jockeying for position since Election Day. Reince Priebus was chief of staff, and aides shouldn’t circumvent him, Mr. Trump told his staff. Steve Bannon was chief strategist and shouldn’t veer too far into foreign policy. Senior adviser Kellyanne Conway, his campaign manager, would shift her focus to communications. Mr. Trump’s first week in office stunned Washington with a torrent of meetings and executive orders aimed at delivering on his campaign promises, including one intended to set in motion construction of a barrier on the border with Mexico. Some Republicans he will need to pass legislation were infuriated, though, when their offices were inundated with constituent queries and complaints about the rushed travel order. His newly minted Homeland Security secretary went before media cameras to give reassurance that the travel restrictions would be implemented in compliance with several weekend federal court orders that blunted its impact. A more subdued White House had its best day Tuesday when it largely abandoned Mr. Trump’s flamboyant style and held a staid ceremony to announce his nominee for the Supreme Court. “There’s been a chastening," one official said. How much of the first two weeks’ tumult was strategic and how much was a result of infighting, inexperience or simple disorganization is hard to pinpoint. This account—based on interviews with White House officials, lawmakers, federal officials, people close to the White House and others who have met with the president in his time in office—shows Mr. Trump has work to do before his White House is running at peak performance. It shows, too, that while he might try to impose more discipline among his staff, his own freewheeling style drives some of the turmoil. Mr. Bannon and policy director Stephen Miller favor a rapid-fire series of executive orders and pronouncements that leaves opponents off-balance. The Real Clear Politics average of approval-rating surveys shows that about 46% approve of Mr. Trump’s performance, compared with 49% who disapprove. Watching the launch of the Trump presidency, many of his supporters say they welcome the jolt of adrenaline he’s delivering. As Mr. Trump’s White House settled in, some rank-and-file staff in the executive branch were still working to understand his agenda. His arrival has generated unease among career foreign-policy experts at the National Security Council, many left out of the policy process, leading some to submit plans to leave earlier than scheduled, people familiar with the matter said. National Security Adviser Mike Flynn and top deputies held a meeting for the NSC staff this past week, at which one person in the Eisenhower Executive Office Building auditorium sought an explanation of Mr. Trump’s call for an America-first foreign policy. A deputy offered an answer: Just as other countries like China put their interests first, so should America. Atop the pyramid, Mr. Trump is hewing to the same improvisational and intuitive style that produced his unexpected victory in November. 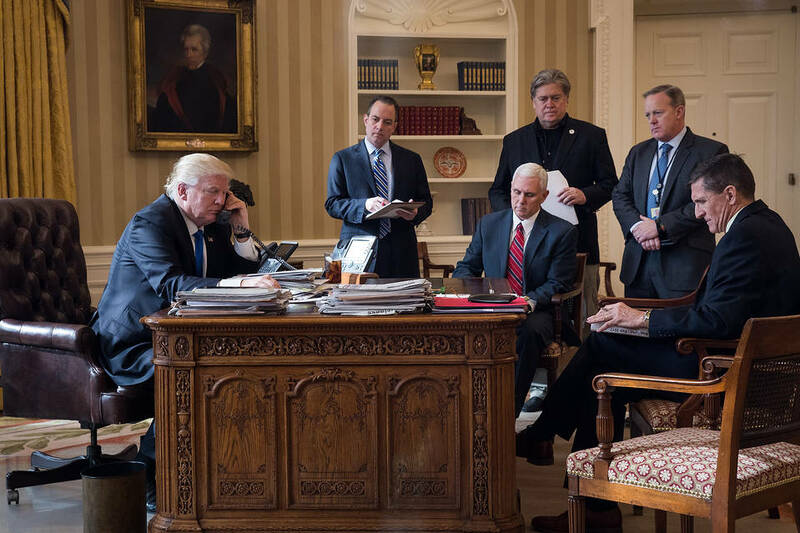 During the transition, Mr. Trump’s team, flummoxed by how he came up with certain ideas, would search for clues by checking his call sheets to see whom he was consulting. Aides say he won’t stop tweeting, nor stop reaching outside the White House for ideas and feedback from old friends. Amid the furor over the travel ban, Mr. Trump spoke on the phone to Thomas Barrack, a former official from the Reagan administration and chairman of the Trump inaugural committee, to ask how he thought the new policy might be received in the Arab world. Earlier this week, Mr. Trump called House Speaker Paul Ryan at 11 p.m. to ask questions about tax legislation, said a person familiar with the call. “As we see it, he sees the big picture, but decisions are not linear—he bounces around a lot. He is constantly asking questions and seeking many people’s opinions,” said a Republican congressional aide. Mr. Trump assuaged some Republican angst over the confusing travel-ban rollout with his nomination to fill a Supreme Court vacancy. Many praised the selection of federal appellate-court judge Neil Gorsuch, pointing to the Coloradan’s experience, educational credentials and conservative record on abortion rights and gun control. While the administration’s second week started with the White House coping with the travel-ban backlash, the week is closing with a new furor over Mr. Trump’s approach to diplomacy as he challenges adversaries and allies in tweets and phone calls. Every new president is tested early by a foreign power. For Mr. Trump, this has come from Iran in the form of a ballistic-missile test, which the administration viewed as a provocation and in conflict with a United Nations Security Council resolution. The White House quickly struck a defiant tone. On Wednesday, Mr. Flynn of the NSC said Iran was now officially “on notice.” Mr. Trump echoed Mr. Flynn’s language in a tweet and told reporters military action was still a response option. Ali Akbar Velayati, an adviser to Iran’s supreme leader, dismissed Mr. Trump as “an inexperienced person” who would learn the pointlessness of threatening Iran, according to the Iranian news agency Fars. Iran denied its test violated a UN resolution. Then on Friday, the U.S. imposed sanctions on more than two dozen Iranian, Chinese and Emirati businesses and individuals for their alleged roles in supporting Iran’s ballistic-missile program. U.S. officials said the sanctions didn’t violate the 2015 nuclear agreement with Iran, which Mr. Trump has often denounced, because Washington had retained the right to blacklist companies and people involved in missile development or terrorism. Mr. Trump was also grappling with homegrown adversaries. He was planning to travel Thursday to the Milwaukee area to tour a Harley-Davidson Inc. factory. The visit could show the president emphasizing his commitment to revitalizing manufacturing, at a motorcycle company that symbolizes American muscle. Randy Bryce, political director of the local ironworkers union, got in the way of the photo-op. He launched a Facebook group called Greet Donald Trump that attracted more than 2,000 RSVPs to demonstrate against Mr. Trump wherever he would appear. Mr. Bryce learned through labor contacts the Secret Service had done a security check at a Harley factory in Menomonee Falls, Wis. He began organizing car pools and buses to bring demonstrators to the middle-class suburb in heavily Republican Waukesha County. Also, “we put up phone numbers for the [Harley] public-relations department and pretty much anybody we could get hold of,” Mr. Bryce said. At Harley, which never acknowledged Mr. Trump planned a visit, executives became nervous about demonstrators, said a person familiar with their thinking. As word spread of the mounting protest, Mr. Trump’s appearance was canceled—at whose behest neither side has said. Harley didn’t comment on why it was canceled. Mr. Spicer, the White House press secretary, said it was easier for company executives to come to Washington. 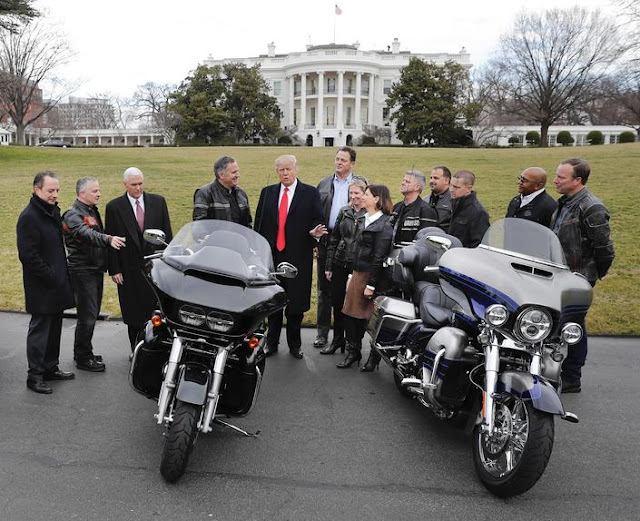 Harley officials instead met with the president at the White House. “We had a great discussion,” said Harley President and Chief Executive Matthew Levatich afterward. The episode pointed to a potential problem for Mr. Trump: He built his political brand through appeals to middle-class voters at big rallies, but if protesters restrict his movements, he risks losing that connection during his presidency. Inside the White House, one flashpoint has been the potential addition of Anthony Scaramucci, an investor tapped to run the Office of Public Engagement and Intergovernmental Affairs. Messrs. Scaramucci and Trump are longtime friends, and Mr. Scaramucci has become a frequent Trump defender in television interviews. He has already struck a deal to sell his interest in his firm, SkyBridge Capital, to buyers that include a unit of a Chinese conglomerate. Mr. Scaramucci’s arrival, though, is being resisted by Mr. Priebus, who doesn’t want to compete with another influential adviser, according to a person familiar with the conversations. A Trump administration official said Wednesday Mr. Scaramucci would most likely not take a White House position, though the offer hasn’t been rescinded. Mr. Scaramucci didn’t immediately respond to a request for comment. People close to him say he isn’t giving up on his shot at serving in the White House. A White House official disputed that there was any tension between Messrs. Priebus and Scaramucci and said it was possible Mr. Scaramucci could join the administration in the future. 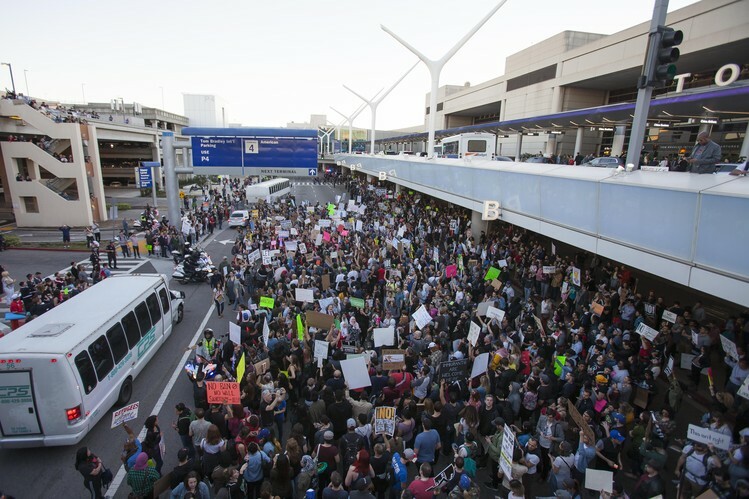 As the week ended, fallout from the travel ban lingered. The president scheduled a meeting on Friday with a group of corporate chief executives. Uber Technologies Inc. CEO Travis Kalanick wasn’t there. On Thursday, he quit the president’s economic advisory council, saying his participation was being misunderstood as an endorsement of the travel restrictions. As Mr. Trump prepared to leave the White House Friday for a quick trip to his Mar-a-Lago home in Palm Beach, Fla., one White House official was looking forward to a brief respite. “I’m so excited,” the official said, about taking a weekend break. —Michael C. Bender, Reid J. Epstein and Rebecca Ballhaus contributed to this article. Chinese companies are increasingly stepping in as lenders, as banks reduce their funding to struggling industries and the country’s mammoth bond market comes under strain. Company-to-company loans in China jumped by 20% last year to 13.2 trillion yuan ($1.92 trillion), according to research firm CEIC. That is roughly double the size of the loan book at Wells Fargo & Co., the U.S.’s biggest lender. This entrusted lending, so named because banks serve as middlemen, is now the fastest-growing major component of the country’s elaborate system of informal, or shadow, banking. 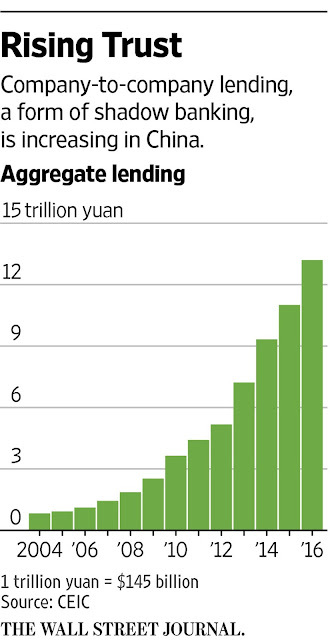 The most recent surge came during the selloff in China’s $9.3 trillion bond market late last year. Big, cash-rich companies—mostly state-owned enterprises and some private companies—stepped in: New entrusted loans rose to 405.7 billion yuan ($59.02 billion) in December, more than double the month prior, according to data tracker Wind Information, and the highest monthly issuance in two years. But the practice poses broader risks for China’s economy. Instead of investing in their core business, companies can earn interest rates of up to 20% making entrusted loans, often with only cursory checks on borrowers’ creditworthiness. Such lending often props up companies in sectors like mining and property where Beijing wants to reduce excess capacity. It also adds to China’s $18 trillion corporate debt pile, already equal to 168% of gross domestic product, according to the Bank for International Settlements. Some entrusted loans are between a company and its own subsidiaries, similar to how many big companies globally loan cash to different parts of their businesses. Still, between 2007 and 2013 more than 60% of entrusted loans were channeled to companies in industries with overcapacity, according to a study by the U.S.-based National Bureau of Economic Research. Aluminum Corp. of China Ltd., or Chalco, is one major company where lending has become a big business. With its main smelting operations struggling due to a glut of aluminum, the company has ramped up its lending to boost profits. 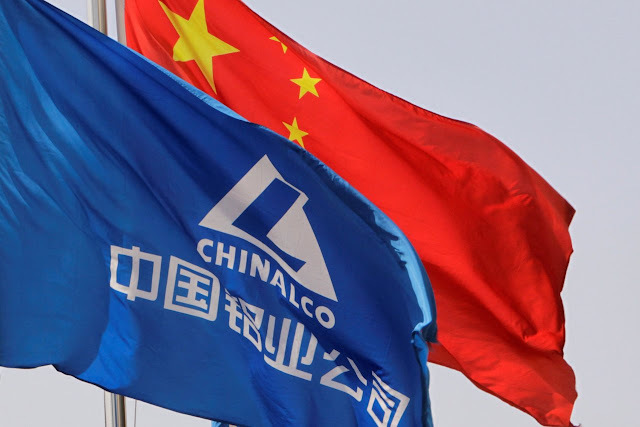 Chalco, a publicly traded unit of state-owned Chinalco, took in 30.7 million yuan in interest income from entrusted loans in the first six months of 2016—more than four times as much as a year earlier and nearly 50% of its net profit. In a texted response to a request for comment, Chalco said the increase in entrusted lending was part of an effort to centralize capital management and employ assets flexibly while lowering funding costs. Company-to-company lending took off in China in the 1990s when, after a period of rapid growth, many state-owned firms started generating large amounts of cash. With no private shareholders pushing for dividend payouts, many put that cash to work by lending it out. Big corporations in other countries have in the past built large financing arms. GE Capital, a unit of General Electric, at one point became a top lender in the U.S. But entrusted lending is unusual. Banks are involved, but only as a middleman: Direct company-to-company lending is still legally prohibited. Banks can charge fees of up to 5% of the loan, according to BMI Research, but leave credit checks to the lending company. “When a bank lends, they have to do their homework, they have experienced credit analysts,” said Warut Promboon, chief ratings officer at Chinese firm Dagong Global Credit Rating Co. Mr. Promboon added that in his experience, few Chinese companies have the personnel to adequately assess credit risks. In some cases, lending companies aren’t pulling back even when loans sour. In June, Datang International Power Generation Co., a state-owned energy company, said it would write off $8 billion of its $10 billion portfolio of entrusted loans made a year earlier to small coal companies in which it owned stakes. Entrusted lending can provide a last-ditch option for companies blacklisted from other funding avenues. Chinese banks aren’t allowed to extend normal loans to companies in default. In December, China Cinda Asset Management Co. agreed to provide Shandong Shanshui Cement Group Ltd. an entrusted loan of up to 8 billion yuan ($1.16 billion). The loan’s terms weren’t disclosed; Shanshui declined to comment. China Cinda couldn’t be reached for comment. Shanshui, one of China’s biggest cement makers, had defaulted on nearly 12 billion yuan ($1.75 billion) of its debt as of June 2016, according to disclosures. A slump in China’s cement industry drove defaults and bondholder lawsuits. Companies sometimes charge sky-high rates for loans to risky industries. Zhejiang Longsheng Group Co., a privately owned chemicals producer whose customers include Nike Inc. and Wal-Mart Stores Inc., according to its website, is charging 17% interest—four times China’s one-year benchmark lending rate—for a one-year, 250 million yuan loan to Zhejiang Time Square Trading Co., a company involved in the property sector, according to disclosures. Neither company could be reached for comment. —Carol Chan contributed to this article. The global shipping industry hasn’t recovered from 2008, and that's more bad news for German banks. In geopolitics, events rarely occur in isolation. On Feb. 9, several stories about German exports, banks and the shipping industry appeared as stand-alone pieces. However, these stories do not gain their full significance unless taken together as part of a bigger picture. There is an inherent link between trade, the shipping industry and banks, given the interdependence of their operations. The latest burst of headlines provides a clearer picture of how the exporter crisis we forecast is unfolding and now intersecting with another forecast on the fall of German banks. Germany reported on Thursday the world’s largest trade balance surplus – its exports surpassed imports by 253 billion euros (almost $271 billion). Germany’s geography has allowed the country to become the leading exporter and one of the world’s most prosperous countries. Its central location in Europe, access to the North Sea and unique riverbed formed by the Rhine, Elbe and Danube rivers have contributed to its success story. Easy access to maritime shipping routes meant cheap transportation and helped create profitable exports. At the same time, an increase in German exports created the fundamentals for developing ports and other fluvial and maritime infrastructure. The development of the shipping business is synced with that of trade. Germany currently derives about 47 percent of its GDP from exports. That means that its stability is dependent on other countries’ ability to buy German goods. The fact that the German current account registered the highest surplus in the world in 2016, surpassing China, underlines Germany’s global exposure once again. The world hasn’t fully recovered from the 2008 crisis. Considering the socio-economic problems in Europe, its largest market, Germany looked to increase exports to other destinations. Russia, the Middle East and China are struggling to keep their economies stable while the U.S. is the only country that has shown real but sluggish recovery since 2008. With the global slowdown in trade and investment, the shipping industry has faced immediate problems. After 2008, there simply were too many ships and too little trade. In the short term, that seemed positive for Germany, as cheaper shipping rates promised safe profits for exporters. But what was good for exporters proved to be bad for German banks. Also on Thursday, Commerzbank, the second largest bank in Germany, announced that earnings had fallen by 5 percent in the last quarter of 2016 as the bank increased provisions against bad shipping loans. The bank expects its losses on shipping loans to be as high as 600 million euros this year after nearly doubling last year to 559 million euros. This follows the announcement last week by Germany’s largest bank, Deutsche Bank, that losses on shipping loans nearly tripled from a year earlier, to 346 million euros. This news points to a major weakness in the German banking system: its financial sector’s exposure to the international shipping industry. Our 2017 forecast explains how the 2008 financial crisis is the root cause behind the exporters’ crisis, which includes, but also extends beyond, Germany. Also subject to the 2008 crisis fallout is the shipping industry, which has not recovered. A crash in the global economy meant a drop in demand for international shipping, which soon saw a surplus of containers and ships. However, instead of scrapping members of their fleets, many companies opted to take advantage of low credit rates and reduced costs to invest in bigger vessels. In theory, this made sense given more cargo could be shipped at one time and the completion of the Panama Canal expansion would allow for larger ships. Over the last two years, fleet capacity has increasingly outstripped trade demand. Again, a domino effect of consequences occurred. Freight rates began to plunge. By early 2016, major world shipping companies formed three trans-Pacific shipping alliances in an attempt to manage cargo share and have more coordinated control of fleet numbers. Both moves were geared toward helping freight prices recover. Freight prices reached record lows in the second quarter of 2016, dropping by as much as 18 percent compared to the previous year. Many of the world’s shipping companies reported heavy financial losses. For only the second time in the company’s history, Maersk reported an annual loss in 2016. Cosco reported a loss of $1.44 billion. The global shipping industry does not expect to see a strong recovery or boost in demand this year. As shipping profits decline, it will become increasingly difficult to service debt. This means banks will run a higher risk of writing off more loans. For Germany, this translates into more bad news. According to the German Shipowners’ Association, German banks and investors own about 29 percent of the world’s container ship capacity. German lenders have been the biggest issuers of shipping loans. Based on Petrofin Global Bank Research statistics, German banks own one-fourth of all outstanding shipping loans made by large banks (about $90 billion). That makes them vulnerable to the shipping malaise. As the shipping industry faces bankruptcies, banks are seeing their losses increase. Besides Commerzbank, smaller banks like HSH Nordbank, NORD/LB and Bremer Landesbank have faced problems since 2010 due to exposure to the shipping business. DVB Bank also specializes in shipping and is experiencing credit problems due to the shipping industry. DekaBank had to cut its business outlook for 2016 by 20 percent because it needed to set aside large amounts for bad shipping loans in the first two quarters. German public broadcaster ARD published a report in January saying that up to 20 billion euros in credit guarantees may be needed to prop up banks in the northern states of Hamburg and Schleswig-Holstein with bad investments in container shipping. So far, none of these shipping-related credit problems have been big enough to challenge the German banking system’s stability. At first view, the announcements from Commerzbank and Deutsche Bank don’t seem to be, either. But the rate at which losses are increasing year-on-year is worrisome, especially since the shipping industry is not expected to recover large profit margins anytime soon. The acceleration of bank losses due to shipping sector problems indicates the increasing vulnerability of the German banking sector to global markets. This is another issue that adds to the list of problems that the German banking system must deal with and another indicator of the increasingly fragile state of the German economy. SANTIAGO – Now that populists are coming to power in the West, a conflict over the intellectual ownership of their approach is brewing. Writers like John Judis claim that nineteenth-century Americans invented political populism, with its anti-elitist stance and inflammatory rhetoric. Argentines, who gave the world über-populist Juan Domingo Perón, or Brazilians, who brought us Getúlio Vargas, might beg to differ. Yet there can be no disagreement that Latin Americans have been the longest and best practitioners of economic populism. In the twentieth century, Perón and Vargas, plus Alan García in Perú (at least during his first term), Daniel Ortega in Nicaragua and Salvador Allende in Chile, and many others, engaged in trade protectionism, ran large budget deficits, overheated their economies, allowed inflation to rise, and eventually suffered currency crises. In recent years, Hugo Chávez and Nicolás Maduro of Venezuela took these policies to new lows. What should the rich world, now undergoing its own bout of economic populism, learn from Latin America’s experience? Make no mistake: judging by the track record of its establishment pundits, the rich world needs some lessons. In Britain, Brexit opponents insisted that if voters decided to leave the European Union, a recession, if not a full-blown economic crisis, would be inevitable. After the referendum, the pound depreciated some, but nothing much else happened. Today, the British economy continues to grow. In the United States, academic economists repeatedly warned that Trump’s economic plans were little short of lunacy, and in the aftermath of his shocking election victory, some prophesied immediate economic catastrophe. Since then, the stock market has reached record heights, commodity prices have recovered, and forecasts of US economic growth keep rising. Have the pundits been smoking something? Or have Trump and pro-Brexit leader Nigel Farage abrogated the principles of introductory macroeconomics? “Ultimately” can be a very long time. Populist policies are called that because they are popular. And they are popular because they work – at least for a while. A sizeable fiscal stimulus in a sluggish economy produces a pickup in growth and job creation. If financial markets turn bullish (as they often do), the exchange rate appreciates, quelling nascent inflationary pressures and making it cheaper to import. And, as Argentine economist and Columbia University professor Guillermo Calvo has long argued, precisely because they are unsustainable, populist policies cause people to shift spending from the uncertain future to the present, when the going is good. This reinforces the expansionary impact of the stimulus, which is particularly strong under fixed exchange rates. So, eurozone countries: beware! With consumption, credit, and employment booming and asset prices sky-high, a warm and fuzzy feeling of prosperity permeates society. Populist leaders feel vindicated, and they are not shy about claiming credit. Their approval rating can only go up – and it does. Soon, teetotalers begin to warn that debt is accumulating too quickly, credit quality is deteriorating, inflationary pressures are incubating, and an overvalued exchange rate is doing lasting harm to exporters. But the music is too loud and the dancing too lively, so no one listens to the warnings. How long can the party go on? One thing we know from the Latin American episodes is that the answer depends, first of all, on initial conditions. Most industrial economies have grown little since the financial crisis. Deflation, not inflation, has been the problem. Yes, the unemployment rate has dropped considerably in the US. But after so many shocks and so much technological change over the last decade, there is considerable uncertainty about how much unused capacity remains and where the non-accelerating inflation rate of unemployment (NAIRU) lies. It could well be that the likes of Trump find that they can stimulate the economy for quite a while before obvious imbalances emerge. The other thing we have learned is that debt, both public and private, does become a constraint. But when and how depends crucially on what kind of debt it is. Today, advanced economies borrow in their own currencies at near-zero (and sometimes negative) interest rates. Even if the starting point is a high debt-to-GDP ratio, it can be a long time before growing debt triggers an emergency. Just ask the Japanese. What happens when financial markets finally get cold feet and stop lending? Well, as the Nobel laureate economist Paul Krugman was at pains to demonstrate in a recent paper, an economy with flexible exchange rates and debt denominated in domestic currency will expand, not contract, in response to a foreign deleveraging shock. (Of course, Krugman was arguing for fiscal expansion under a Democratic president, but the point still stands.) Not even then do you get an immediate crisis. In 1953, Perón sent a message to Chilean president Carlos Ibáñez, a fellow army general. “My dear friend: give the people, especially the workers, all that is possible,” he wrote. “There is nothing more elastic than the economy, which everyone fears so much because no one understands it.” Trump, should he come to think about it, might stumble to the same conclusion. Anti-populists in the US, the UK, and elsewhere must come to terms with the reality that bad policies pay off, both economically and politically, long before they become toxic. Yes, the excessive private and public debt, the loss of export capacity, and the weakening of institutions harm the economy (and the polity) – but only in the long run. If critics do not understand that and act accordingly, populists will have as long (and destructive) a run in the rich countries as they once had in Latin America.